Spinal decompression for neck pain can be accomplished using surgical or noninvasive methods of care. Decompression therapy is utilized in an effort to increase the patency of the central spinal canal and/or the neuroforaminal canals in the cervical spinal region. Spinal decompression treatment is used to resolve suspected cases of spinal stenosis or foraminal stenosis that can be caused by a wide range of conditions, including osteoarthritis, atypical spinal curvature, vertebral listhesis, intervertebral herniation, ligamentous abnormalities and all manner of acute traumatic injuries. This focused dialog examines various methods of nonsurgical and operative spinal cord and spinal nerve decompression that are used to treat problematic neurological conditions in the cervical spinal region. We will also detail the expected outcomes of successful therapy and the reasons for instances of failed treatment. Discectomy is the most common of all spinal operations and is used to decompress the central or foraminal canals and relieve mass effect on neurological tissues enacted by bulging, herniated, ruptured, extruded or sequestered intervertebral structures. Not all discectomy surgeries are used for decompression purposes, but many are included under this umbrella heading. Laminectomy is the second most common form of decompression surgery and is used to treat an exhaustive range of diagnoses. Lamina removal allows the surgeon to manually increase the size of all the spinal canals, eliminating pressure from sensitive, impinged tissues. Laminectomy is often combined with other surgical options, such as discectomy, artificial disc replacement and spinal fusion. Corpectomy removes one or more vertebral bodies and is typically used in cases of extreme central stenosis or ultra-severe traumatic injury. Corpectomy is also a combination procedure; since the defect in the spine must be repaired once the vertebra is removed, necessitating the addition of spinal fusion or an implant-based restorative procedure, such as the Synex, Xpand or Fortify systems. Facet joint trimming techniques can be used in cases of severe neuroforaminal stenosis leading to nerve root compression and subsequent pinched nerve symptomology in the neck, shoulders, arms or hands. Implant-assisted stenosis operations allow some patients to enjoy marked spinal canal decompression with less damage to the spinal structures. Nonsurgical decompression of the cervical spine is a newer approach to care in the neck pain treatment sector. Luckily, the growth of available services has led to better treatment outcomes for many patients, without the risk, pain and complications often associated with invasive surgical therapy. Nonsurgical spinal decompression falls into 2 basic categories of treatment: modern, machine-controlled systems and manually applied methods of therapy. Computerized systems of decompression represent the state of the art in the industry and have allowed many patients to find cures for a variety of diagnoses without surgery, injections, drugs or other hazardous interventions. Best of all, results seem to be long-lasting or even permanent for many successfully-treated people. The most widely utilized systems of decompression include the VAX-D, the DRX-9000C, the AccuSpina and the Antalgic Trak devices. Treatment requires considerable financial expense and time investment, but may help to resolve many disc-related nerve compression issues, as well as some bone-related stenosis concerns. Manually-enacted cervical spinal decompression techniques include traditional traction, inversion, chiropractic manipulation and specialized manipulative therapies, such as Cox Technic. Chiropractic adjustments can help to relieve symptoms of some types of stenotic conditions and are certainly effective for resolving vertebral subluxations deemed causative for the current symptomology. Traditional spinal traction is rarely used anymore, since doctors now realize the practice to be counterproductive in most instances. Inversion is a home remedy that has been used for thousands of years to treat an assortment of health disorders. Cox decompression is a focused practice that is applied by specially-trained chiropractors to manually decompress focal areas of stenosis, hopefully freeing pinched nerves and possibly even lessening pressure on the spinal cord. The primary goal of decompression therapy is to remove damaging and symptom-producing pressure on the spinal cord and/or spinal nerves. Therefore, most operations and nonsurgical interventions are deemed successful if this objective is successfully met. Unfortunately, this does not mean that symptoms will resolve and in some cases, even “successful” treatment may result in increased pain and neurological expression. 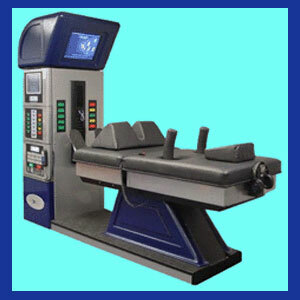 Statistically, nonsurgical spinal decompression using one of the modern, computer-enacted systems provides good to excellent curative results for indicated conditions. These treatments work best for disc-related stenosis problems and less so for osteoarthritic accumulations in the spinal joints. Chiropractic, inversion and Cox therapy are less effective, but can provide acceptable to good results for some patients with highly-specific diagnostic criteria. Surgery used to enact spinal decompression in the neck provides a mixed bag of results. Some patients find immediate and lasting relief, while others do not. Some patients report no symptomatic improvement, while others suffer escalation of pain or a variety of sometimes severe postoperative complications. All neck surgeries involve great risk to life, health and functionality, especially those that involve operating on or near the spinal cord. In many cases of disappointing treatment results, a mistaken diagnosis might be to blame. After all, many instances of central and foraminal stenosis are normal parts of the aging process and do not create the actual symptomatic mechanism. Even perfectly-performed surgeries that are deemed fantastic successes from technical points of view often do not help to relieve symptoms. These scenarios almost always involve misdiagnosis of the actual causation for pain. Therefore, patients are always strongly cautioned to be absolutely sure of the validity of their diagnostic pronouncement before taking any step towards surgical resolution of their theorized spinal cord or spinal nerve compression.